Scoring 5th place in our top 5 matero list is Alicia Silverstone. This muse of the 90s starred in Aerosmith videoclips, but is perhaps best known for her role as the bitchy Cher Horowitz in Clueless. I haven’t seen Alicia on TV for a while, but she now has a blog called The Kind Life, where she regularly posts fitness tips. In one of her posts, she has revealed yerba mate to be one of her favorite alternatives to drinking coffee. “She takes supplements of natural origin with ginseng and yerba mate”. And the second place goes to Viggo Mortensen, of course. Originally from New York, he spent part of his childhood in Argentina, where he acquired the habit of drinking yerba mate and a strange fanatism for San Lorenzo de Almargo Football Club. Mortensen drinks yerba mate regularly and takes it with him wherever he goes. Not long ago, he was held by airport security officers who confused his yerba mate for something a little less legal. You can read the full story here or check out my own experience with yerba mate in airports here. The first place goes to Pope Francis himself. 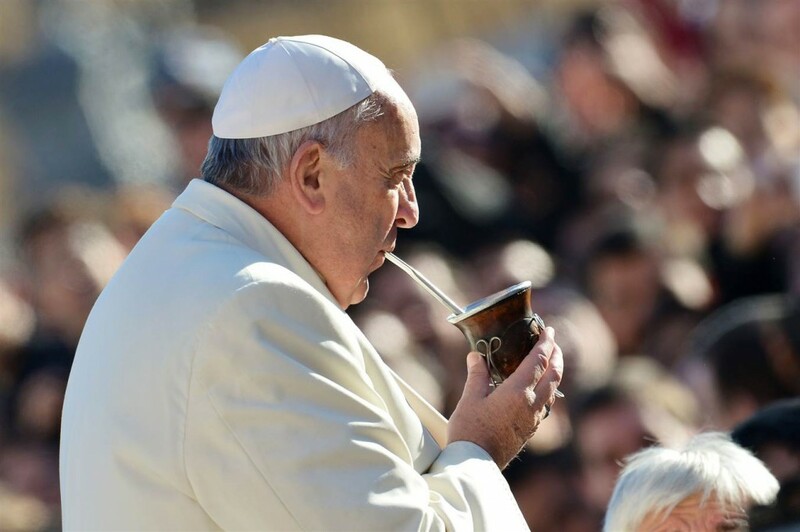 The Pontiff was born and raised in Argentina and the fact that he now occupies the highest pedestal of the Catholic Church hasn’t stopped him from holding on to his Argentine roots. This and the fact that he is clearly more awesome than the German Pope before him, makes him the absolute top matero on this list.